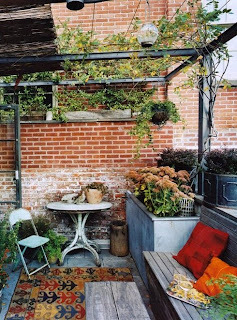 Whatever outdoor space you have - a grand garden or a small balcony - in the nice weather you enjoy it for living and dining as much as your indoor rooms - so why not decorate it with as much care! Of course, auctions are a great way to add character and create a wonderful outdoor 'room'. 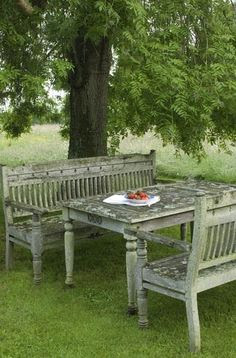 Wonderful weathered benches and table. Classic bistro chairs, but painted white and distressed, always works and so simple. I love this small space. If you can add an arbor it really makes a room. An arbor gives you something to hang a lantern from as well. They even have a rug. 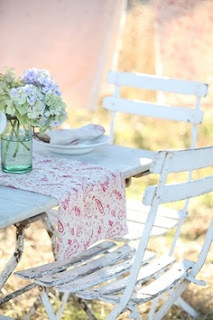 This is a wonderful rustic table and vintage chairs set under an arbor - so welcoming. 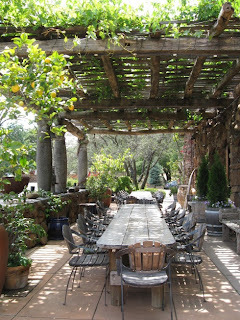 I could see a my friends and me having a meal and hanging out all afternoon. 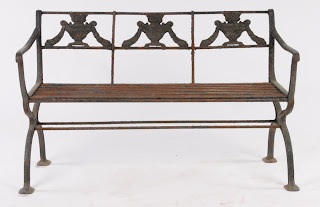 Kamelot Auctions in Philadelphia regularly has garden themed auctions, so I didn't need to go further for this post to find some great examples of how you can decorate your outdoor room with pieces with terrific character and patina. This Hollywood Regency dining set is the perfect place to start. I love the green paint and the baby blue cushions. This is circa 1960, and sold for $600 for the set off an auction estimate of $600 - $900. 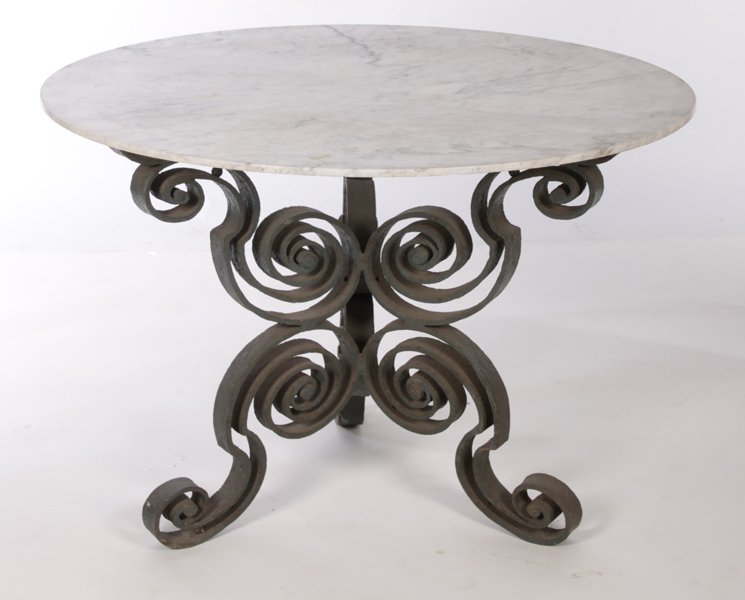 This Philadelphia circa 1910 wrought iron table with marble top (43" diameter) is fabulous. The base is so decorative and only needs some simple bistro chairs to sit down to a meal. This sold at Kamelot for $1,600 off an auction estimate of $1,500 - $2,500. 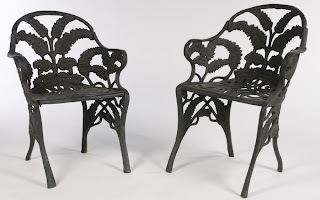 These Italian wrought iron chairs (above), circa 1980, have that sleek Italian chic. The set of 8 sold for $800 off an auction estimate of $800 - $2,400. 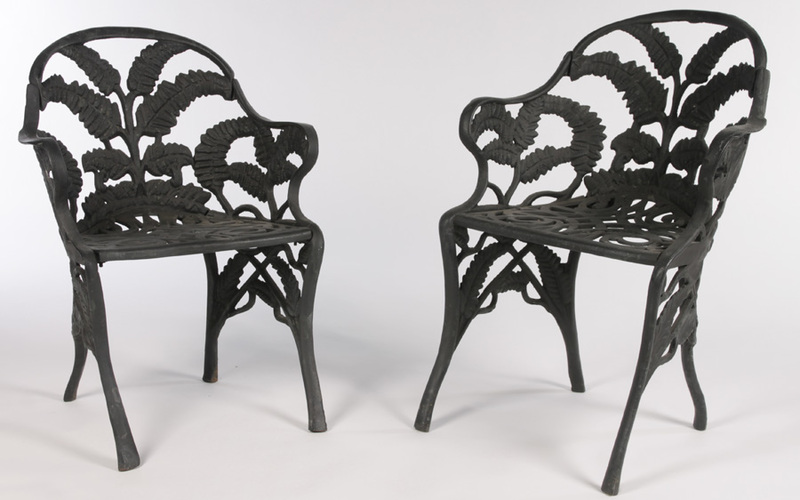 For lounging try these cast iron armchairs with a fern pattern. They are so decorative, and just call for a small table in between to set a drink down! These sold for $500 off an auction estimate of $200 - $400. 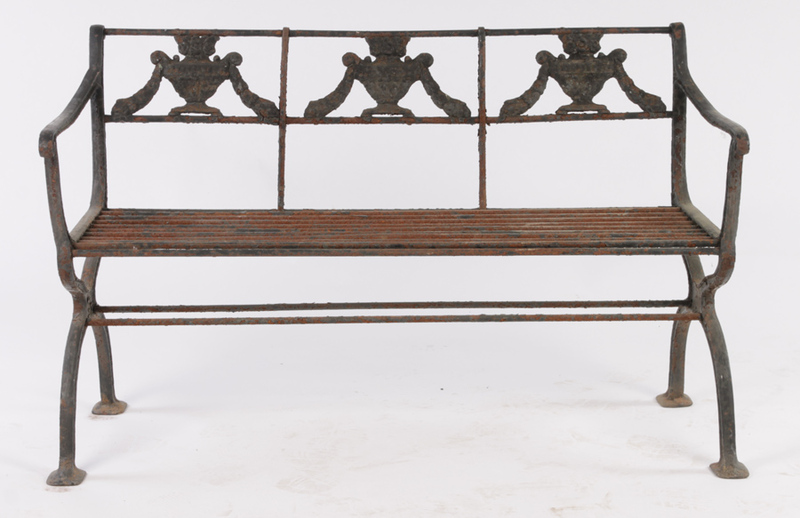 For your 'sofa', with added cushions, or as dining seating, this classical bench (48 " long) with urn and garlands decoration on the back is very stylish. 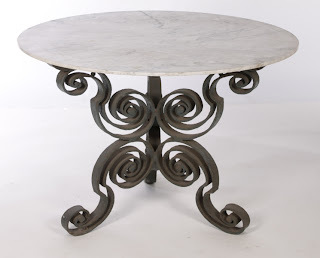 It's circa 1900 so has the antique cred that really adds character to the space. This sold for $1,000 off an auction estimate of $700 - $900. 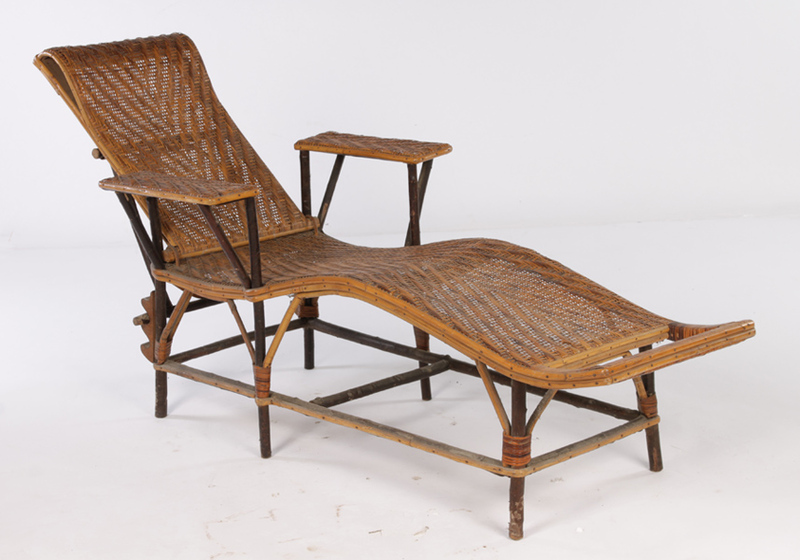 I just live this French chaise lounge for outdoor resting and reading. This is circa 1910, and makes for a welcome garden look. This sold for $900 off an estimate of $400 - $700. We need some decoration as well. This planter is perfect. It has chinoiserie decoration along the front, and wonderful paw feet. It's 46 inches wide, and would be wonderful filled with flowers or small bushes. It's circa 1940, and sold for $200 off an auction estimate of $300 - $600. 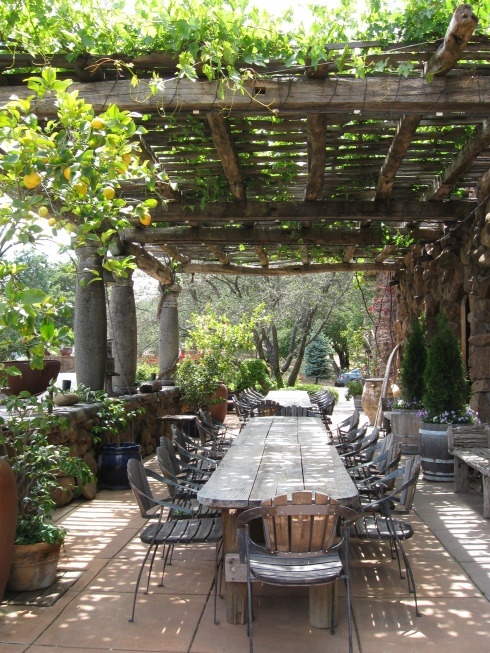 Outdoor spaces seem particularly conducive to using rustic pieces. They automatically give the space that lived in weathered look, that you would have to wait for with anything new!